BELLVILLE — On Saturday Oct. 13 about 100 people braved a chilly morning to see and hear some of Bellville’s historical characters tell their stories. 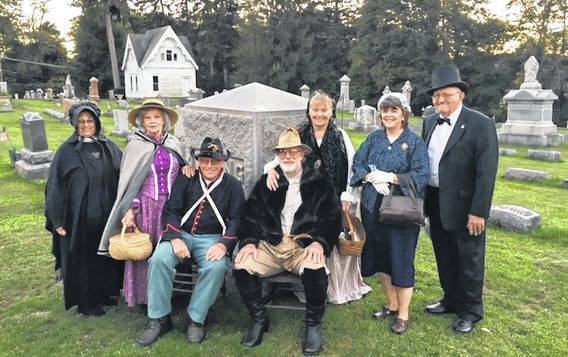 Seven people came alive and stood beside their gravestones to speak to people about the interesting and significant history of Bellville. William Oldfield 1750 – 1837 (87) born in Orange Co NY, a Revolutionary War veteran who migrated to Ohio in 1803. In 1810 he moved to the Honey Creek Valley, making his family some of Bellville’s earliest White settlers. Portrayed by Jim Wagner, sixth generation descendant. Accompanied by his wife Elizabeth Taylor, portrayed by Becky Wagner. Mary “Mamie” Armstrong Hess 1860-1931, (70) Born in a cabin on Renie Road, taught school in Knox County for a while. Active in the Women’s Suffrage movement by marching in parades in Bellville and Mansfield. Also active in church and charter member of local Pythian Sisters. Portrayed by Joann Palmer, granddaughter. Susan Viola Oldfield Paste 1869-1961 (91) wife of Mel Paste, and descendant of William Oldfield. Susie was from a musical family; she and Mel hosted Sunday evening sing-alongs that sometimes ended with a pot luck but always with homemade ice cream. Portrayed by Ruth Ann Kilgore, granddaughter. Ora Snyder Sr. 1894-1973 (78) patriarch of the Snyder Funeral Homes portrayed by Paul Snyder, son. Ora started his first funeral home in Shauck (Johnsville) Morrow County in 1922. His sons/grandsons/ and great grandsons now operate 15 funeral homes and crematoria in a six county area of Central Ohio. Evaline May Wheatley Stone 1909-1982 (72) She was born in Nottingham, England and never went out without being properly dressed. Moved from Elyria to Bellville in 1935 to marry her sweetheart, Howard W. Stone, local grocer. She was a Sunday school teacher, homemaker, mother of one daughter and twin sons. Portrayed by Beth Hobson, granddaughter. Olive Elizabeth Shaffer Forbes 1899-1999 (100) was a local teacher and WCTU activist. She directed the junior choir for the Lutheran church. Got a bachelors degree in physics and a masters degrees in chemistry. Discovered a way to keep shredded wheat from crumbling by adding a mineral (calcium?). Olive was a descendant of William Oldfield. Portrayed by Reita Linton, local librarian. Who donated the land for the original cemetery? What was the condition of this donation? Frederick Fitting. He and his wife were to be buried on the highest part. Whose is the biggest stone in the cemetery? C.B. Hines. Whosestone is from the foundation of her house? Mary Eggerman. Whose stone has a statue as part of the monument? Kochheiser. For what was the Beal vault ultimately used? The Beals moved the bodies to Mansfield and the vault became a place to store bodies before interment if the weather was too cold to dig a grave. For what was the chapel used during World War II and the Korean conflict? It became a lookout for enemy planes, known as the Ghost Post. If you have ideas about Bellville history people who are interesting, please contact Lynn at cfox6@neo.rr.com or 419-295-0680. We are hoping to make future cemetery walks an annual event.